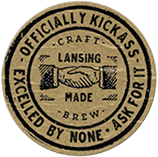 We’re Lansing Brewing Company, the city’s coolest place to be in the heart of the Stadium District. The Lansing Brewing Company serves as a living testament to the hard-working men and women who built our great city. We embrace our city’s roots while heralding in a new beer-loving generation just in time for Lansing’s rebirth. Receive discounts, coupons, deals, and more! And don’t forget to join our exclusive Mug Club!